Absent much leverage, Russell Wilson’s camp self-imposed a deadline on talks to extend the Seahawks QB’s deal. What if a trade offer included a shot at Kyler Murray? Finally, we can officially engage in the the biggest Seattle sports story of 2019 — the football future of Russell Wilson. Perhaps you thought the biggest story was the Huskies making the NCAA men’s basketball tournament for what seems like the first time since Marv Harshman had dark hair. Or what the KeyArena roof will do floating above Seattle Center in a windstorm. Or the Mariners becoming the most accidental good team in MLB history. But just in case you wanted the biggest story to be the Seahawks’ drafting of former Huskies QB star Jake Browning, now it seems at least plausible. Because if it’s true, per the Seattle Times Tuesday, that Wilson wants a contract extension by a self-imposed deadline April 15 or the negotiations are over, it at least allows the Seahawks to trade him for a passel of picks ahead of the April 25 draft, not to mention a few top-tier veterans in their primes. The Seahawks could then take Browning (I can actually hear you cringing from here). Or they could take Heisman Trophy-winning QB Kyler Murray, the most Wilson-like QB since the man his ownself. The talent haul could be sufficient in a draft in in which the Seahawks at the moment have only four choices. Freed of the Wilson contract, the Seahawks could extend the deals of LB Bobby Wagner, DE Frank Clark, DT Jarran Reed and add other premium players. Do I expect that to happen? No. But do I expect the Seahawks to consider it? Damn straight. By leaking news of the deadline, what Wilson’s agent, Mark Rodgers, did was stir the pot. That’s what agents do when they have so little leverage. Who knows what might bubble up? Seven years into a career as healthy as it has been remarkable, Wilson is coming off his most efficient season, with a career high in touchdowns (35) and a tying career low in interceptions (seven). At 30, based on the Brady/Favre/Brees/Rivers Scale of Biomedical Age Avoidance, he has eight to 10 years of top play left. Given that proven QBs at the top of their games, with no major personality disorders, come along as often as acid, drop-the-mic one-liners the moment the boss fires you, the market for Wilson would be intense. Just take a look at general manager John Schneider’s text messages since the story broke (I haven’t, but if you contacts with Saudi intelligence agencies, access, please text me). I imagine Schneider responded with steaming-pile emojis, then just as quickly entertained the second responses. Wilson has a final year remaining on his current four-year contract, and can remain in Seattle for 2020 if the Seahawks put the franchise tag on him, at a cost of about $30 million. They could tag him again in 2021 at around $36 million. By then, who knows what Wilson’s health, the QB pay scale, coach Pete Carroll’s passion (nearly 70 by then) and the NFL’s latest collective bargaining agreement — not to mention the entire world — will look like then. The Seahawks hold nearly all the cards. Rodgers must do what he can to make a market for Wilson now, ahead of draft. Once the draft passes, teams largely are settled into their personnel plans following the biggest signings in free agency. A trade could still get done, but front-office paranoia is at its apex ahead of the draft, when Rodgers would like to stimulate a stampede. A contract from the Seahawks or any team would likely exceed in average annual value the deal of Aaron Rodgers, who gets a $33.5 million stipend from Green Bay. Wilson will get $25.2 million this season. The lesser known markers are length of deal and guaranteed money. The most money guaranteed in the current market is $94 million for Atlanta’s Matt Ryan, and $84 million for Minnesota’s Kirk Cousins. 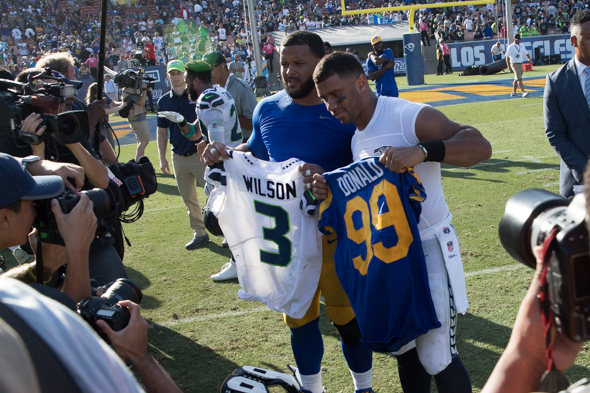 As far as length, the Seahawks want as many years as possible, and Wilson’s camp probably wants no more than three, so he can re-enter the marketplace in his later prime. However the negotiations play out, including what happens after the April 15 deadline if no deal is struck, Wilson said after the season ended he was ready to play into his final year despite all the speculation about his future that would come with it. In his seasonal post-mortem, Carroll sounded as committed as ever to Wilson. Given their success together, there’s little doubt the Carroll wants to keep Wilson. But also given the results after re-tooling the 2018 roster and coaching staff, Carroll also has to be intrigued about the franchise renewal possible with another premier QB on a rookie contract. If nothing else, the deadline could put the biggest story of the year to rest in two weeks instead of 18 months. It’s time to look for a different paradigm than the franchise quarterback all of sports media is so enamored. Pete Carroll was close to writing the future before the 2nd Super Bowl mishap. Let Wilson play out this final year, thank him profusely, and wish him well in New York or wherever Mrs. Wilson will be most happy. Forget about trade value and franchise tags. One more season. Don’t understand that thinking at all. Wilson is a highly valued asset. Either lock him up, or get as much as you can for him when you still have him. Letting him go after one more year does neither. Reeb, again you go where no one has gone before. For good reason. And who in the world has ever mentioned the Seahawks drafting Jake Browning before today? A late April Fools joke. April 15th deadline… isn’t that the IRS? I figured Jake’s name would angry up the blood of a few readers. And if you need to ask about April 15, get thee to an accountant. The college-pro QB transition is so unpredictable. I’d love to see Jake get the last laugh. Like every QB, Russell is one torn ACL away from changing everything. But, he’s the face of the franchise. Offer him a max deal by April 15th. If he turns it down on the 16th, keep him, draft a quarterback (I liked the QB from West Virginia), have a good 2019 and go from there. The Seahawks have three years (2019, 2020 and 2021) to figure it out. That’s management’s plan, except in the NFL there are no max deals. As I wrote, length and guaranteed money are variables. I don’t think the Seahawks want just two years and 100 percent guaranteed. But if I’m Wilson, that’s what I’m asking. By max, I meant Rodgers money, or Trout money, or Kaley Cuoco money. Money is great, but today’s journalists are due respect and appreciation for the jobs they perform as Constitutionally mandated watchdogs of our liberties. No group, with the possible exception of teachers and police officers, deserves our respect more. I have no real idea what they would do but I do KNOW that Jake Browning is not the person to step in and I have seen nothing out of Kyler Murray to convince me that his football IQ – Russell’s greatest attribute – is high enough to make him a viable replacement. If we’re actually going to talk about Wilson playing out the string for one year, I’d rather see Gardner Minshew as his understudy than anybody else I can think of. Whatever he may lack in any other areas, he’s a stone-cold gym rat who knows football history as well as many coaches and has an assassin’s cold-eyed aggressiveness under pressure. Given a good QB coach and a solid O line, I think he could be an absolute stud. He even has a bit of running ability; nothing like Russell’s, of course, but he’s not a statue back there. Without looking too hard at everyone else, Minshew would be my choice. After working the Apple Cup, I’d recommend that Minshew’s team not be in Chicagoi GB, Buffalo, Boston or NY. And for that matter, Seattle. All the “Apple Cup” proved was that the Huskies were better at standing up in snow than gthe Cougs. Play that game on a dry field and there’s a MUCH different outcome, guaranteed. April 15, the Ides of April. Russ is living history. My prediction he remains a Seahawk. Is there cash involved on your forecast? Et tu Russ, will not happen. PC doesn’t want to rebuild in what may be his last years coaching. Oh my, that’s two predictions. I half expected Wilson to negotiate his own deal instead of using his agent. Evidently like before they’re probably going to be demanding, set ultimatums and we can expect nothing but subtweets from DangeRuss. So if the 15th passes with little progress will Wilson put on the Infinity Gauntlet, snap his fingers and destroy half the universe? Wilson and Rodgers have a high degree of trust between them. Wilson is smart enough to let someone else be the bad guy. I don’t see Wilson as close to Thanos as to Peter Parker. Your usual great humor and exceptional insight, Art. Thanks! I have a naïve question about the franchise tag: How does that work with respect to guaranteed money? If the Hawks tag him and he gets hurt, does he still get all the money? My other question would be your assessment of how Russ would play and act if so tagged? Does he have it in him to have a bad attitude, or would the relationship be irreparably poisoned? Of course, to lose him would be tragic, and to lose him for nothing in return would be apocalyptic. Franchise tags are 100 percent guaranteed, every dollar paid counting against the cap in the single year. That’s the part that management doesn’t like. I doubt Wilson would play any differently under a tag. He’s too competitive, and it would hurt his future standing/earnings. As far as the apocalypse, that’s why the Seahawks have to at least seriously consider a trade. My completely uninformed guess is that the next collective bargaining agreement is going to have a QB cap like the NBA’s max deal, regardless, as you said, the Seahawks have the cards. Offer him a good deal, if he doesn’t take it, franchise him and draft for the future. The franchise cap hits seem reasonable in a world where Kirk friggin’ Cousins is getting $84 mil guaranteed. Another fun fact, the top six highest paid QB’s were all at home for the playoffs. Only four QB’s have won Super Bowls since 1994 who accounted for more than 11% of their team’s cap. Steve Young, Peyton Manning, Tom Brady and Eli Manning. So you basically need a GOAT contender or super hot Eli Manning. I’d take Russ over Eli any day, but I don’t put him up with those other three. Balancing the Wilson contract against the costs to field a playoff team around him is the hardest issue for Schneider. It’s a tough decision. RW had a TD/INT ratio of a ridiculous 5 to 1 – unheard of, and a career mark of 3.1 to 1. That is a tie with Brady! Manning, Montana were in the low 2’s, Namath was NEGATIVE (more INT’s than TD’s), Staubach and Aikman were in the low 1’s, etc. So RW is as efficient a QB as there has been in history, and if he is not signed, there is no comparable replacement. Then you say – Can we free up $35m and spend it more wisely elsewhere? I would opt to keep RW and franchise him for the 2 years, so he is a Hawk for 3 more years, then test the trade waters. ALSO, I would consider, in this DL heavy draft, trading Clark, saving at least $17m, and most likely picking up at least 2 high draft picks. “Since Marv Harshman had dark hair” I spit out my dentures!